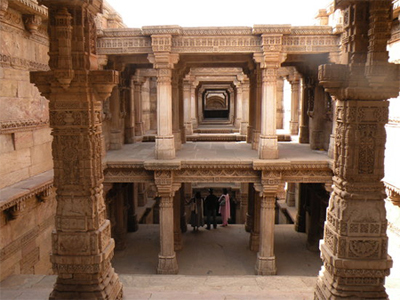 Adalaj Vav is a five-storey step-well on the outskirts of Ahmedabad. 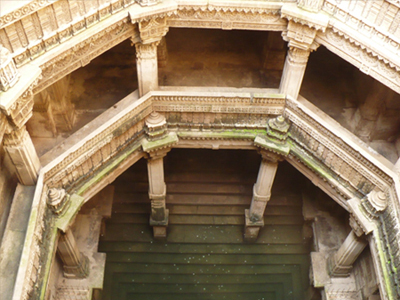 Perhaps the finest stepwell in Gujarat, Adalaj was built in 1555. What makes this stepwell the most beautiful amongst other is its series of platforms and galleries built on the side of the stepwell. It looks like a tales of unrequited passion and events are revolving around it. 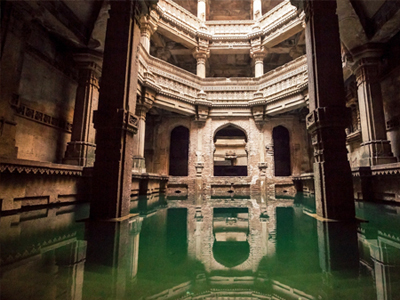 The story behind the making of this legendary stepwell is as fascinating as its architecture. Adlaj Vav was commissioned by Rani Roopba, the queen of Rana Veersingh, a local chief who was defeated by the Muslim ruler Mohammed Begda. The stepwell was under the construction process when her husband (Rana Veersingh) was vanquished by Begada. Begada was so stunned by her beauty that he made a marriage proposal to Rani Roopba. Playing it safe, she said that she will accept the proposal on only one condition that he will have to complete the construction of five-storied water vav as a sign of devotion. Begada was so much charmed by the queen's beauty that he agreed and took up the challenging task. As the years rolled by, Begada completed the construction, minus the domes and proposed to the Rani Roopba once again. The next day, Rani Roopba jumped into the well, ending the saga of building the well in tragedy. After listening to the news, Begada stopped the construction. Till date, every visitor who comes here prays for the spirits of Rani Roopba as they believe that her spirit still resides here. 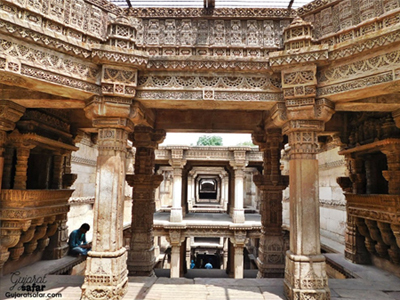 Adalaj stepwell is the finest example of Indo-Islamic architecture as here one can see a fusion of Hindu craftsmanship and the geometric pattern of Islamic architecture. All the five stories of Adalaj structure use cross beams all along their length. The octagonal spaces unfold in front of eyes while steps take one to the circular well at the end of those steps. 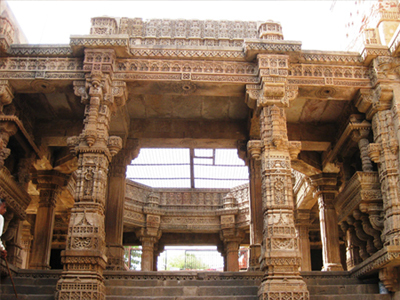 The entire structure of stepwell consists of beautifully carved columns, finely crafted niches and platforms. Flight of the steps leading to circular tank, entrance pavilion at the ground level and well at the lowest level are the three distinctive feature of Adalaj stepwell. The stepwell is one of its kinds in Gujarat as it has three entrance stairs that lead to the stepped corridor. All three entrances of the stepwell converge at the first underground storey in a square platform where tourists gather to savour its beauty. As one descends towards the well, the temperature starts getting cooler than outside. Each floor has a large number of rooms that are well ventilated. 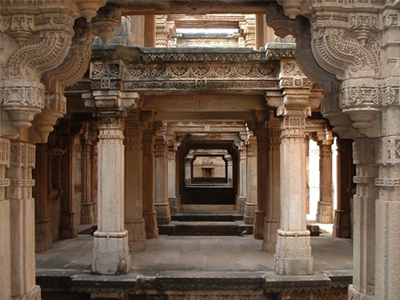 The unique part of the stepwell architecture is the fact that the sunlight does not touch the flights of steps or landing. Apart from the abstract symbols of the god and goddesses, the panel of the Adalaj are decorated with beautiful panels depicting scenes showing caring of a king sitting on a stool with two chauri bearers, the churning of buttermilk, and musicians accompanying dancing women. It is a belive that small navagraha friezes at the edges of the wall protect the monument from evil spirit. People from neighboring villages usually come here to offer prayers to the deities carved on the walls and to interact with each other under the cool shade of the vav or step well. All thanks to Ahmedabad tourism, Adalaj Vav is still in a perfect condition and invites visitors from visitors from all over the world to marvel at the splendid architectural delight. All thanks to its exquisite carving and embellishment, Adalaj is a clear winner of being the perfect landmark in Gujarat.